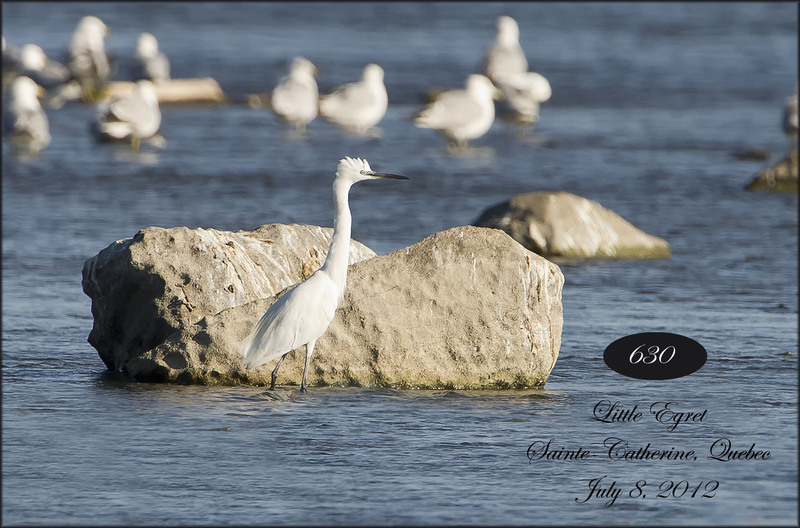 Last night I got a call from a friend telling me that the ABA.org website had posted that a Code 4 Little Egret, Egretta garzetta, at Côte-Ste-Catherine “récréo parc” in Lachine rapids, near Montreal, Quebec. This morning 3 of us went down to see this great European visitor. The Little Egret is looks alot like the Snowy Egret, but appears larger, has a longer neck and bill, has black lores. Leaving at 5am we drove straight to the spot and wow..there it was feeding 50 yards off shore. Its great when a plan works out. Turns out this is the second Little Egret I have seen on Quebec. I forgot about the first one – doh! Paul, I enjoyed our discussion yesterday along the Shirley’s Bay dike. Too bad it was so windy, but it was still a good outing.